...Wayne Pumps & Agriculture Solar Powered Water Pump Power Increases Efficiency, Lowers Costs and Maintenance. We offer tailor-made solutions that work with you to create energy cost savings. 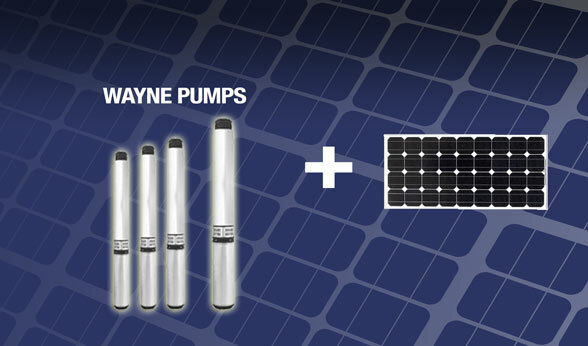 WAYNE Pumps and Agriculture Solar offer a full line of pumps and power systems, and accessories. Our business team is customer focused, continuously developing innovative products for growers, creating packaging and merchandising to make the experience easier, providing fast delivery and superior after-the-sale support. • Assembled in the US. Water well pumps are used to deliver water from an underground water source to your destination. WAYNE Pumps and Agriculture Solar offer 3 types of well pumps and power: shallow well jet pumps, convertible well jet pumps and deep well submersible pumps. At Agriculture Solar, Wayne Pumps and Agriculture Energies can be your simple water pump solution. Wayne Water Systems is a market leading provider of commercial, worry-free, water handling solutions. For more than 80 years the WAYNE brand has given owners security and confidence that their wells systems work reliably and growing areas are ready to grow. Agriculture Energies systems have been dedicated to modern agricultural irrigation and successfully active in the top irrigation fields for over 10 years and continues to bring the tried and true principles and advantages of solar hybrid power. Think about it, and then make your move. Let Wayne Pumps and Agriculture Solar water management provide you with decades of reliability and lasting value. We invite you to explore the possibilities of our reliable hybrid solar powered pump solutions.